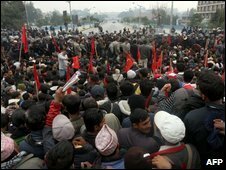 Maoist activists have clashed with the police as thousands demonstrated on the streets of Nepal's capital, Kathmandu, against the governing coalition. Riot police used tear gas and batons to disperse activists who had surrounded the the main government complex and blocked all entry points to the area. It is among the biggest protests staged by Maoists since losing power in May. The Maoists have said they want a debate in parliament about the extent of presidential powers. They emerged as the largest party in Nepal's election last year, but say President Ram Baran Yadav acted unconstitutionally by overruling their decision to sack the army chief earlier this year. The Maoists accused the head of the army of opposing the integration of thousands of former Maoist rebels into the national army. The president's decision to overrule his dismissal led to the collapse of the Maoist-led government in May. 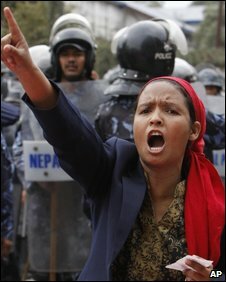 The protests have caused traffic chaos throughout Kathmandu and are expected to continue on Friday. The demonstrators blocked the entrances to the main government complex. They shouted slogans such as "Down with the puppet government" and waved flags. "Nepal may have become a republic, but we have yet to achieve true people's rule," protester Shanchalal Waiba told the AFP news agency. "This protest may bring difficulties to the people in the short term, but in the long term it will bring a better future." The BBC's Joanna Jolly in Kathmandu says that many taking part in the protests were young men and students who had been bussed into the capital earlier in the day. The Maoists say they will continue their protests until their demands are met. The coalition government has asked the Maoists to call off their protests. It has refused to discuss their demands, saying the issue has already been resolved.